Do you live in Spring Hill? Spring Hill is a census-designated place (CDP) in Hernando County, Florida, United States. The estimated population was 98,621 in 2010 by the United States Census. Spring Hill belongs to Florida's Nature Coast and is in the Tampa-St. Petersburg-Clearwater metro area. Spring Hill was founded in 1967 as a planned community, which was developed by the Deltona Corporation and theMackle Brothers who built the community. The plans for the community are actually identical to the community of Deltona, Florida. The Mackle Brothers sold many of the properties and land in the area through intense advertising. It appeared on maps of Florida as early as 1856. It has since become a sprawling semi-city in its own right, though it is an unincorporated area. The main entrance to the original development is marked by the Spring Hill waterfall on Spring Hill Drive and U.S. Route 19 (Commercial Way). Its location has Hernando Beach to the west, Brooksville, Florida to the east, and Tampa to the south via the Suncoast Parkway, US 41, and I-75. 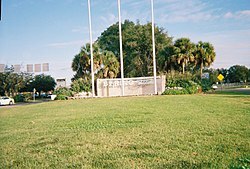 Spring Hill is the largest town in population north of Tampa in the St. Petersburg-Clearwater metro area. Spring Hill has in the past two decades attracted a large number of business chains, reflecting the recent boom in population and the tastes of the recent influx of residents seeking lower property values, quiet suburban life, and a low crime rate. With its proximity to Tampa, about 35 miles (56 km) south and the completion of the Suncoast Parkway in 2001, has made Spring Hill easily accessible to the Tampa-St. Petersburg area. Spring Hill is located at 28°28′44″N 82°32′52″W (28.478929, & 82.547732). According to the United States Census Bureau, the CDP has a total area of 54.8 square miles (142 km2), of which, 53.1 square miles (138 km2) of it is land and 1.7 square miles (4.4 km2) of it (3.12%) is water. As of 2010, there were 44,435 households, with 12.1% being vacant. In 2000, there were 28,274 households out of which 23.8% had children under the age of 18 living with them, 62.2% were married couples living together, 9.0% had a female householder with no husband present, and 25.6% were non-families. 21.1% of all households were made up of individuals and 13.7% had someone living alone who was 65 years of age or older. The average household size was 2.39 and the average family size was 2.74. In 2000, the CDP the population was spread out with 19.5% under the age of 18, 5.8% from 18 to 24, 21.2% from 25 to 44, 24.2% from 45 to 64, and 29.4% who were 65 years of age or older. The median age was 48 years. For every 100 females there were 89.5 males. For every 100 females age 18 and over, there were 86.7 males. The median income for a household in the CDP was $32,861, and the median income for a family was $37,608. Males had a median income of $30,076 versus $21,364 for females. The per capita income for the CDP was $17,184. About 6.4% of families and 9.5% of the population were below the poverty line, including 14.4% of those under age 18 and 5.6% of those age 65 or over.